In 1845, British explorer Sir John Franklin set out on a voyage to find the North-West Passage - the sea route linking the Atlantic Ocean to the Pacific. 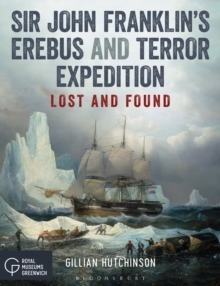 The expedition was expected to complete its mission within three years and return home in triumph but the two ships, HMS Erebus and HMS Terror, and the 129 men aboard them disappeared in the Arctic. The last Europeans to see them alive were the crews of two whaling ships in Baffin Bay in July 1845, just before they entered the labyrinth of the Arctic Archipelago. The loss of this British hero and his crew, and the many rescue expeditions and searches that followed, captured the public imagination, but the mystery surrounding the expedition's fate only deepened as more clues were found. How did Franklin's final expedition end in tragedy? What happened to the crew? The thrilling discoveries in the Arctic of the wrecks of Erebus in 2014 and Terror in 2016 have brought the events of 170 years ago into sharp focus and excited new interest in the Franklin expedition. This richly illustrated book is an essential guide to this story of heroism, endurance, tragedy and dark desperation.